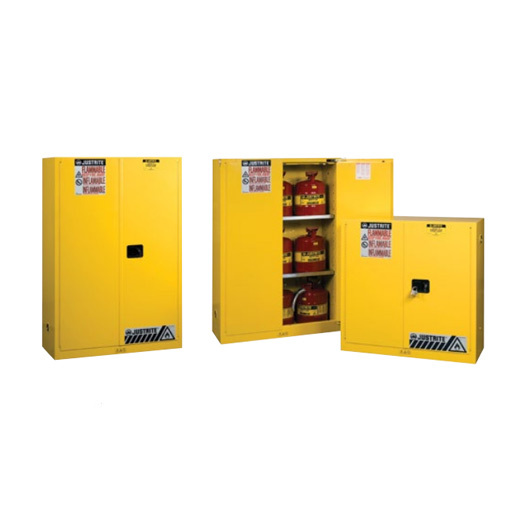 Designed to meet OSHA and NFPA 30 standards, Sure-Grip® EX cabinets are constructed of sturdy 18-gauge (1-mm) thick double-wall, welded steel with 1-1/2-in (38-mm) of insulating air space for fire resistance. High-performance, self-latching doors close easily and securely for maximum protection under fire conditions. Fail-safe closing mechanism ensures three-point stainless steel bullet latching system works every time.